The April winner of the monthly competition to win a Bury Market hamper came into collect her prize from market manager Andrew Heyes. Patricia Hargreaves of Waddington won the competition with her response to the question of what she liked about Bury Market. 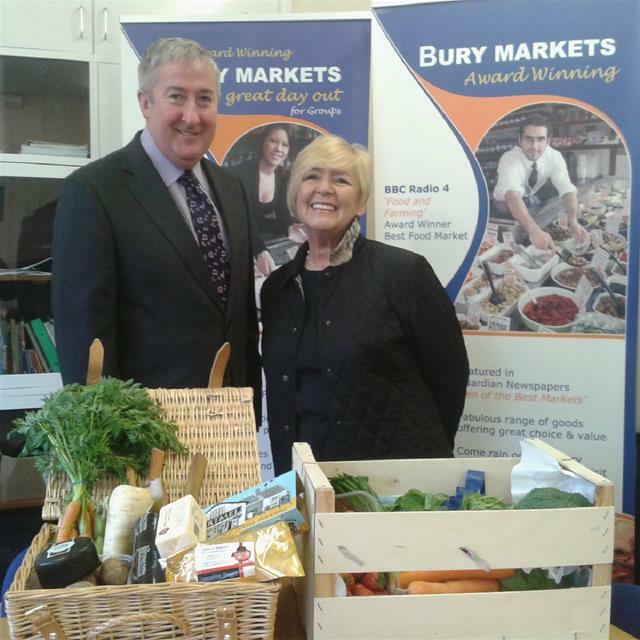 Patricia said, "I have only become reacquainted with Bury Market in the last 12 months. I never realised what I was missing out on all these years! Fabulous fresh produce, fantastic variety and the unrivalled friendliness of stallholders! It's Bury Market for me, for the rest of my life!! An absolute pleasure"
The picture shows Patricia collecting the Hamper, containing a selection of local produce, from Andrew Heyes the market manager. The monthly competition is ongoing to December and each month there is an opportunity to win a £25 hamper, everybody that enters will also be entered into a final draw to win a £100 Christmas hamper.